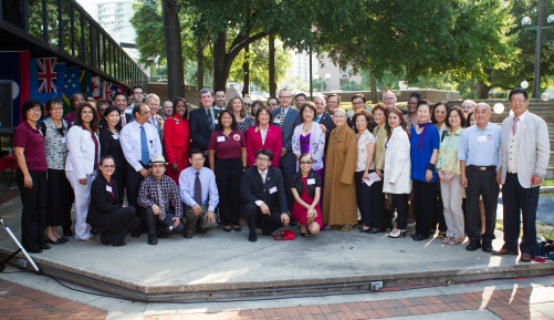 The event, now in its third year, was coordinated by the Orange County Asian Committee (OCAC), an employee-based volunteer organization formed in 2012 with the goal of promoting and preserving the heritage and culture of Asian Americans, forming partnerships throughout the community, and building relationships with local and international governments. Mayor Jacobs provided her remarks at the event, joining Orange County District 2 Commissioner Bryan Nelson, District 3 Commissioner Pete Clarke, District 4 Commissioner Jennifer Thompson, District 5 Commissioner Ted Edwards and District 6 Commissioner Victoria P. Siplin. “Many Cultures, One Voice: Promote Equality and Inclusion,” is the theme for the 2015 Asian Pacific Heritage Month. The Distinguished Asian Award was presented to retired U.S. Navy Capt. Steve “Snak” Nakagawa who is the executive director of the STEM Alliance of Central Florida and director of workforce programs for the Florida High Tech Corridor Council. The Outstanding Community Service Award winner was Shally Wong, publisher of Asia Trend Magazine and executive director of Asia Trend/YESS Center. Additionally, the winners of the student art contest were announced. The art was displayed in the Orange County Government Administration Center lobby. Music was performed by Professor Qiuyu Zhou and student Rong Tong; and by the “Notes” trio of Corey Hsiao, University High School, Jenna Chen, Winter Park High School, and Caitlin Chen, Sanford Middle School. The traditional Lion Dance was performed by the Orlando Lions group and the Indian dance was performed by the Bollywood Dance Academy.